My friend Mimi is the parent I sometimes wish I was. Among a dozen other wonderful characteristics, she creates these genuinely different, difficult and valuable experiences for her kids. They’re always out there, trying new things and exploring. And—here’s a real kicker—you know how, even though you yourself aren’t bilingual, you always swore you’d help your kids learn another language? She actually did it. And this year, they’re living in that country, and speaking that language. Earlier this week, I got an email from Kristen Wreggit headed “The Rare One.” In it, she suggested we forward it to a friend and tell them what makes them such a rare and amazing part of our lives. I forwarded it to Mimi, and while I wasn’t surprised that she replied and said nice things about me, exactly what she said did surprise me. It turns out that the things I think are fantastic about her as a parent, the things I admire and aspire to, are sort of the opposite of what she appreciates in me: my faithful adherence to family traditions and my determination to give my kids a home base that feels steady and unchanging. I bet there’s another parent out there who does things you think are fantastic, and maybe make you just a little bit green with envy. Why not tell them so—and, in the process, remind yourself that we don’t all have to do all the fantastic things? There is only so much time, and we can only be ourselves. You might make music with your kids, and that might be key to your happiness. You might sail, or have watched every single episode of Dr. Who together. You might meditate as a family every night or belong to a parent-kid book club. I think all of those things are amazing. I wish I did every one, and a dozen other things parents I know do with their kids besides. I don’t. I do some great stuff. You do some great stuff. We’re all figuring out our own family happiness. So tell somebody you totally love what they’re doing as a parent, without feeling like you need to do it too. I am so glad you were able to thank someone in your life for being “a rare one.” And this post takes it to the next level – we are all extraordinary in our own ways. We cannot be everything but we can be enough. 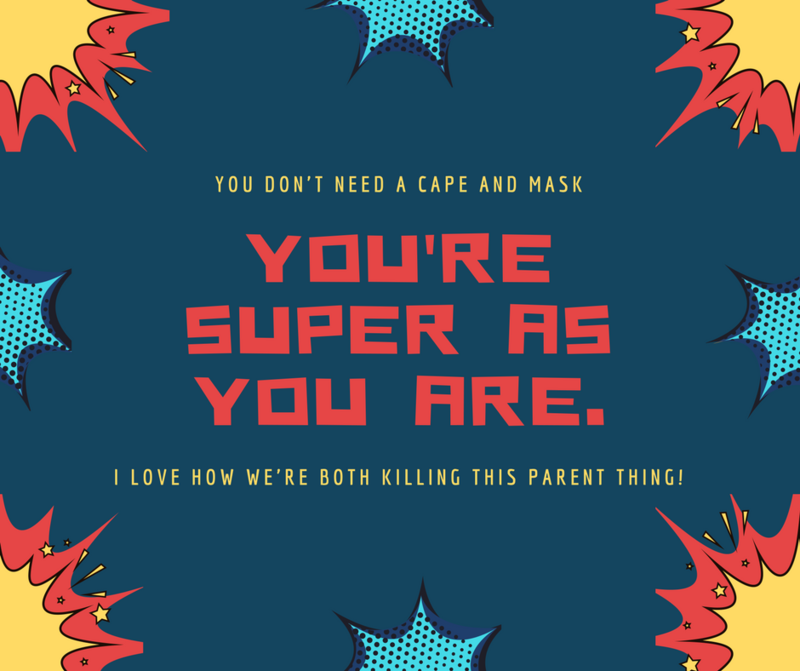 Thanks for sharing this perspective with Moms…some of the most super women I know.